Today’s post is pretty close to my heart. My friend, James Hamme, presented his piece “Gather Around” at the FORCE QUIT New Media BA show in the Passage Gallery at SUNY Purchase. 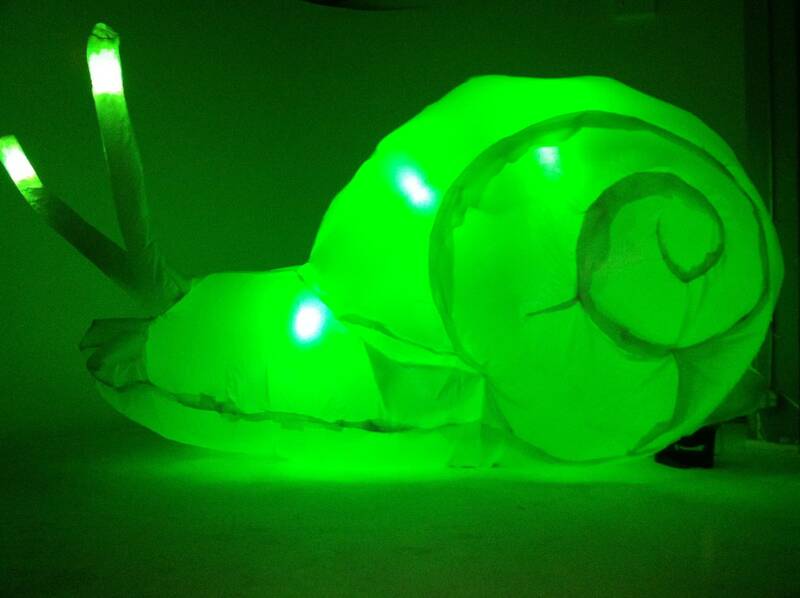 The show opened on April 21st and runs until April 30, and the reception was held on April 23rd. 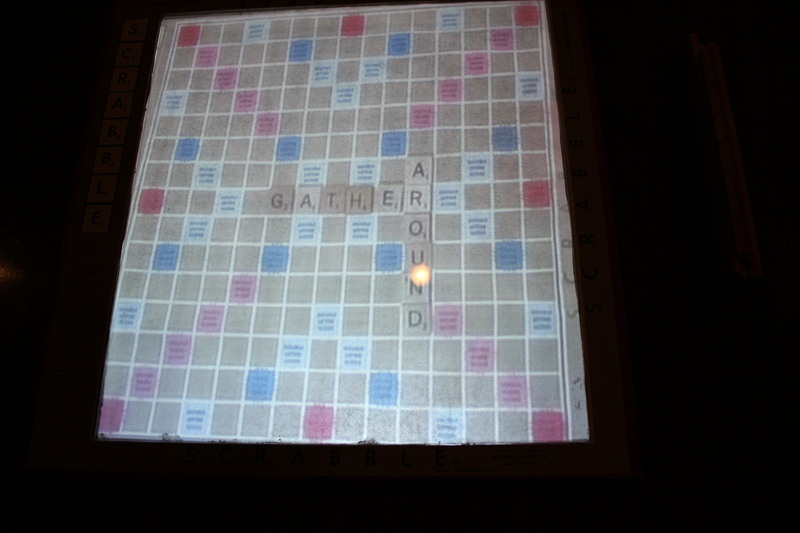 “Gather Around” is a dinner table with a Scrabble game projected in the center that uses the letter tiles to create words describing the different stages of life, termed by Hamme as Childhood, Teenage Years and Today (Hamme is currently completing his Senior year in the School of Film and Media Studies as a New Media Major at SUNY Purchase). It was part nostalgic board game, part Star Trek hologram. Amidst the flashing colored lights, and leather straps latched to a giant bed with YouTube videos aflutter, this piece certainly brought to the forefront a quiet presence with a message that spoke clearly through the visual noise. The use of language and family night to communicate the passing of time, a coming of age and the anxiety over the possibility of something lost when a person grows up, leaving behind youth, innocence and the family unit is perfectly executed. It captures that moment when we all look back and try to remember our childhood homes, amplifying the moments we had sitting around the dinner table and sharing meals as well as those quiet nights alone, when you remember turning the key in the lock and walking into the dimly lit entry of a home that you know is either asleep or empty, but either way, no one is there to greet you. James Hamme’s beautiful use of subtlety certainly stays with you well past the moment after you leave. Please, please visit the Passage Gallery at SUNY Purchase to see this show. It’s FREE!! It’s exciting when you find something this close to your heart. In my attempts to share free art in the greater NYC area with all of my readers (currently FIVE! ), I found a great site that features all of the awesome FREE stuff that’s out in Williamsburg, NY! Currently there are people out there working the streets of Brooklyn in an attempt to share with world things like inflatable artwork on subway heating grates, an alphabetical listing of all free galleries and there’s even a section for nightlife. Every couple of weeks I visit friends out in Flatbush, so I’m excited to use this site to navigate the area. If you have any free events in your area, give a shout out and we’ll post a review right here! Happy Trails! !